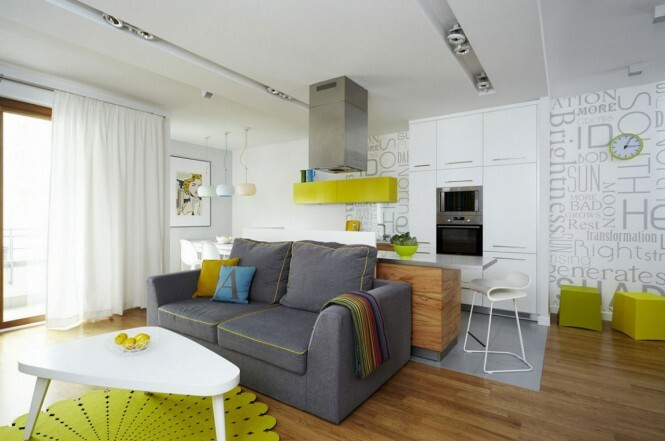 A wall mural is custome made for this living room to match the whole apartment's graphic. 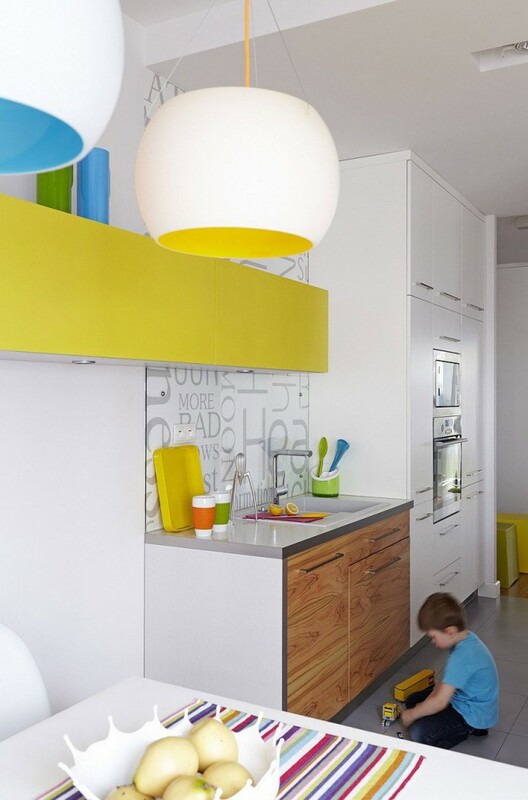 On coming spring occasion I please your attention – a very vivacious and contemporary flat interior, designed by “Widawscy Studio Architektury”, is established in Poland. 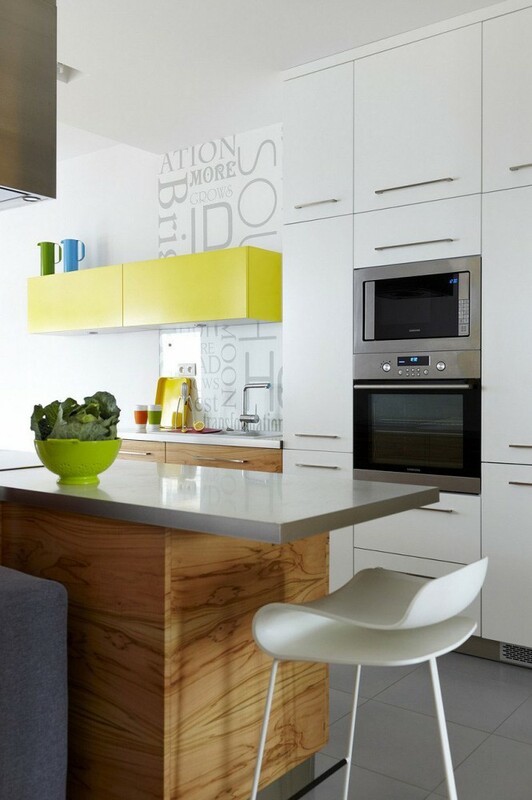 An interior which pulsates life and high spirits – a perfect version for those who are waiting for a sunny and warm spring! As it's already usual, there are several areas in one space: kitchen, dining room with a guest room, hall and work area. Such a function lets a family spend more time together, which was an aim of the lords while creating this interior. 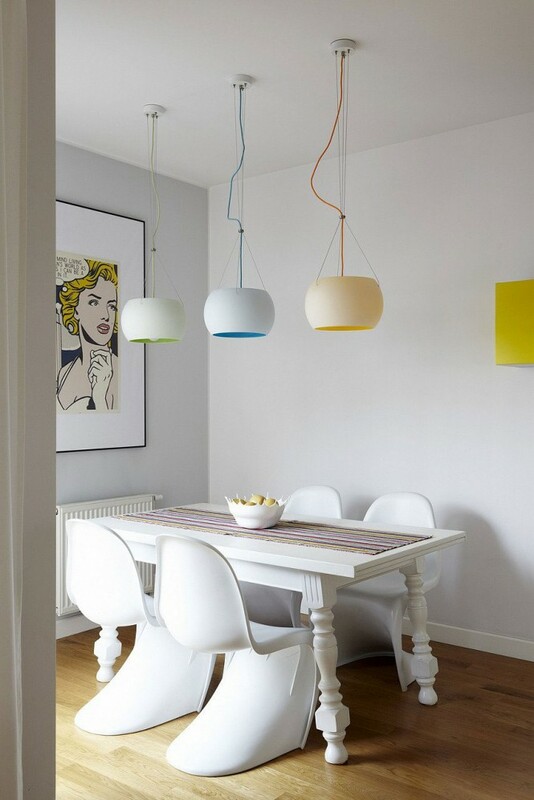 White color is accompanied throughout the natural wood floor and several brighter colors chosen – yellow, salad color, blue and some other colors which are not considered to be main ones. Pay your attention to how a unity in separate areas is created by coloring some things the same color. An impression of freshness and high spirits is created. 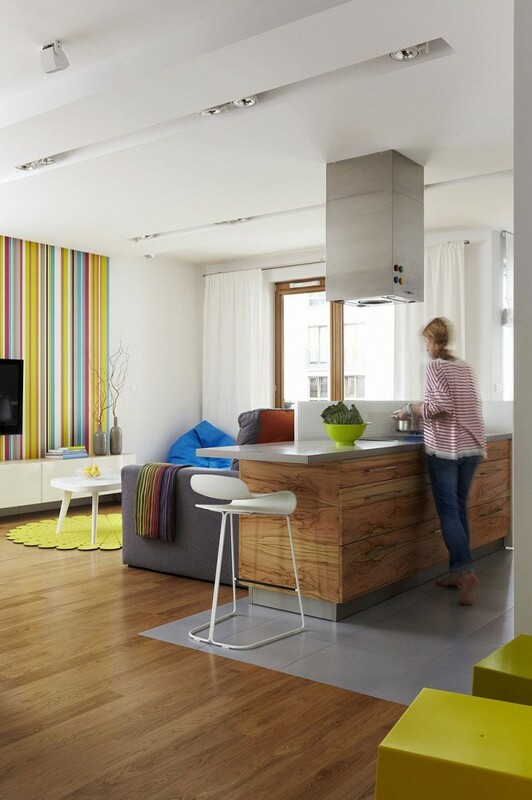 A wall mural with colorful stripes is custome made for this living room to match the whole apartment's graphic. A mirror hanging in a hall over the entire wall connects spaces and eliminates any boundaries. 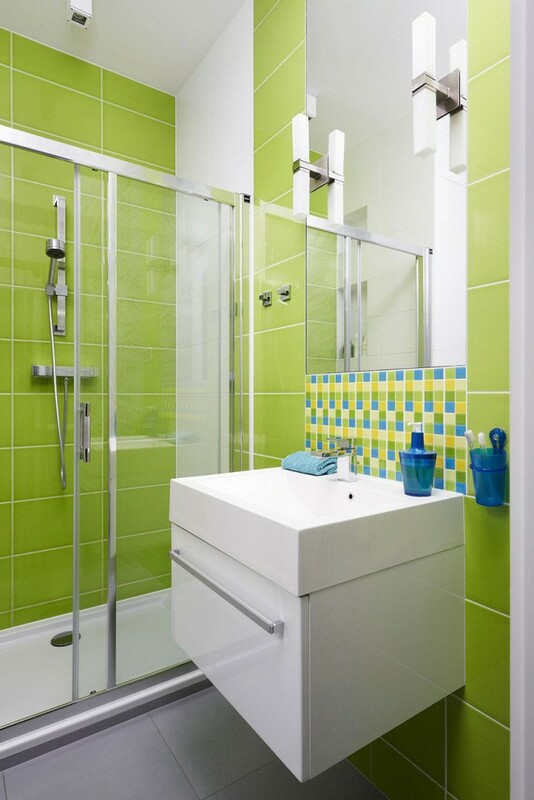 In bathroom the same mood with salad color accents is kept. 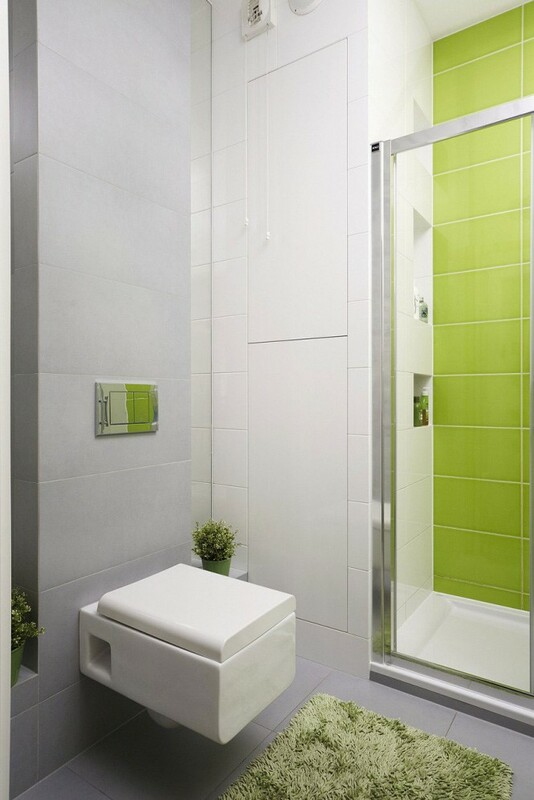 As you see – despite the fact that a room is indeed small, it looks very light and relatively spacious. 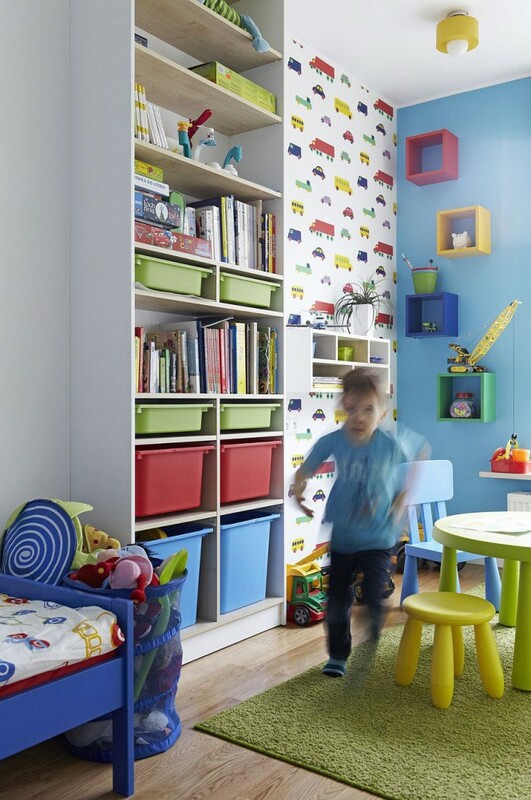 A boy’s room as it's usual for children is colorful, playful and contemporary. A bedroom – the quietest room with no color accents. 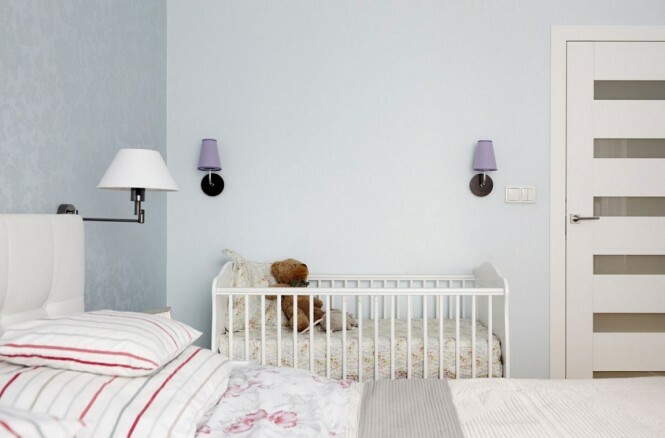 Well, at least one room needs to have tranquil colors so that it was possible to have a rest, to quietly sleep and that bright colors did not bother the smallest family member who takes a place just of a small baby bed. Colorful and wallpapered ceiling - an exclusive solution!